Everyone's Irish on St Patrick's Day! Put on your best Irish garb and join us in Downtown Sioux Falls for the festivities. Run the 5 Mile! Run th 5K! Run the Mile! Hey it's St Patrick's Day, why not run them all! After the races, join us downtown for the awards ceremony, post party, and watch the parade! LIMITED EVENT DAY REGISTRATION & PACKET PICKUP: online registration only and race day packet pickup will only consist of bibs and timing chips. Full packet pickup is offered on Friday. You may also pickup the remainder of your packet following the awards ceremony. PRIZE MONEY: Up to $2,000 in Prize Money available for breaking the course record on the 5 Mile, 5K, Mile, or Irishman. The Team Competition winners (minimum 10 group participants) will have $200 donated to the charity of their choice. ALLSPORTCENTRAL ELECTRONIC TIMING & TIME TRACKER: ALLSPORTCENTRAL Electronic Timing and Time Tracker will be used for all three races and will enable participants to view results shortly after crossing the finish line via cell phones, PDAs, pagers, or e-mail. AWARDS & BEST COSTUME: Our famous Leprechaun Shoe Trophies will be awarded to the Top Overall, Best Costume, and Highest Group Participation (corporation, organizations, or groups). Certificates will also be awarded to the Top 3 Overall, Top Masters, and Age Group Winners. We will also draw for door prizes, but you must be present to win! All runners will receive an event shirt, and refreshments with their registration. Purchase of a St Patrick's Day Parade button during registration is required by each runner participating in the 1 Mile Run. The St Pattys Day Mile (SPDM) runners are the 'first float' of this iconic downtown Sioux Falls parade! Each year, Phillips Avenue is lined with spectators ready to cheer. 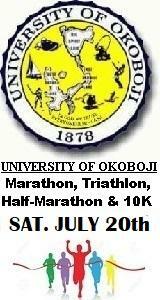 The Race Organizers reserve the right to cancel this event at any time due to inclement weather and/or safety concerns. In any instance the event WILL NOT BE RESCHEDULED and NO REFUNDS will be issued. HOW DO I GET ONE OF THOSE GREAT ST PATTYS DAY MILE TECHNICAL SHIRTS? Those who register online AT LEAST 4 WEEKS PRIOR to race day will be guaranteed a shirt at packet pickup. Sizes are subject to availability based on registration date. Remaining shirts will be available on a first come first serve basis to the remaining online registrants. Late entries will be notified via email when the additional shirt order has been received. Participants that do not get a shirt at packet pickup, may come by the AllSportCentral office following the event to pick up their shirt, or have the option of paying an additional $5.95 shipping and handling fee to have the shirt mailed out. Straight down Phillips Avenue. Start near 13th St & Phillips Ave. Finish near 2nd St and/or Falls Park Entrance. Route will be loop course starting and finishing at Fawick Park (10th St & 2nd Ave, Statue of David) winding through the bike trails. Route will be out and back course starting and finishing at Fawick Park (10th St & 2nd Ave, Statue of David) winding through the bike trails. Run the Mile! Run the 5 Mile! Hey, run them both! Now your thinking grand! Here you go boy-oh! Run the 5K! Then run the Mile. Hey, it's St Patty's Day, why not? Run the Mile! Run the 5 Mile! That is a fine lark on St Patty's Day isn't it. Compete for the IRISHMAN Title by running the 5 Mile, 5K, and Mile. IRISHMAN Finishers will get a free finisher's certificate documenting their accomplishment and an IRISHMAN shirt. OVERALL IRISHMAN WINNERS will have the lowest combined time across all 3 events. The male and female winners will win a famous Leprechaun Shoe Trophy.